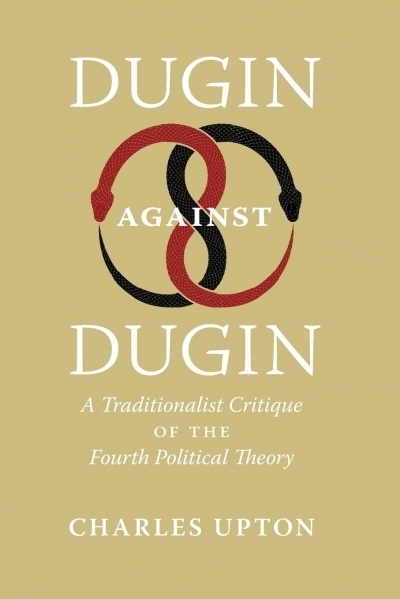 This article is based on excerpts from Dugin against Dugin: A Traditionalist Critique of the Fourth Political Theory by Charles Upton (published December 2018). In the process of attempting to bring both Sufism and Shi‘i Iran into his Neo-Eurasian fold, Dugin unexpectedly commits an outrageous act of cultural misappropriation. In the section on The Rise of the Fourth Political Theory entitled “The Purple Archangel of Russia,” he shamelessly attempts to take possession of the spiritual being who appears in Shi‘i theosophist Suhrawardi’s The Recitation of the Purple Archangel. The Purple (or Crimson) Archangel — al-‘Aql al-Surkh — is an imaginal manifestation of the Active Intellect (‘Aql) who appears in order to conduct Suhrawardi to the summit of Mt. Qaf and the attainment of Haqiqah, the fullness of spiritual Truth. In other words, the Purple Archangel is, precisely, an Iranian Ishraqi (“Illuminist”) version of the Logos — the Logos that Dugin, in “The Metaphysics of Chaos” from The Fourth Political Theory, has already declared to be philosophically null and void. In his own imagination, however, the Purple Archangel is the true dawn of Great and Sacred Asia, which is the secret angel, the secret substance of Russia, her historical, spiritual mission spread over everything — politics, culture, sociology, our history. Here Dugin, like the magician he is, attempts to take illegal possession of the archetypal essence of Iran — Suhrawardi being the sage who, more than anyone else, made a synthesis between the spiritual universes of Islamic and pre-Islamic, Zoroastrian Persia — doing so as an act of subtle-plane conquest in ‘Alam al-Mithal, the realm of Objective Imagination. This is an act of theft so brazen, so lacking in any normal sense of holy fear, that I don’t know what to compare it with. And in addition to being sacrilegious, it is patently absurd. I might just as well claim that Fyodor Dostoyevsky was a great American novelist, or that the real Kremlin is in Pennsylvania somewhere and the one shown in Moscow only a later copy; I have more right to do this, in fact — even though I have no right to do this at all — than Dugin has to loot the Purple Archangel of Suhrawardi. Furthermore, above and beyond his willingness to make alliances of convenience with the takfiri apostates, Dugin cannot be a true friend to Islam because he speaks in the name of a different religion, not one of the accepted revelations sent by Allah (swt) but a pseudo-religion created by himself — though he has appropriated elements of it from many different sources, including the Nazi jurist Carl Schmitt and the Nazi philosopher Martin Heidegger. In addition, certain Western commentators have accused Dugin of having affinities with the notorious occultist, reputed Satanist, and British Intelligence agent Aleister Crowley. And the fact is that Dugin has written appreciatively of Crowley in a number of places. For example, in an essay on the late Russian musical genius Sergey Kuryokhin, he says, “The new aeon will be cruel and paradoxical. The age of a crowned child, an acquisition of runes, and a cosmic rampage of the Superhuman. ‘Slaves shall serve and suffer.’ The renewal of archaic sacredness, the newest and, at the same time, the oldest synthetic super-art is an important moment of the eschatological drama, of ‘the tempest of equinoxes.’ In his Book of the Law, [Aleister] Crowley argued that only those who know the value of number 418 can proceed into the new aeon…” Most people would think that anyone who puts in a good word for an occultist who called himself “the Beast” could not at the same time be a faithful Eastern Orthodox Christian — and, of course, they would be right. So, we are expected to postpone God until we have found our “ontic motherland,” until we discover who we really are in ethnic and cultural and sociopolitical terms, until (that is) we discover our real identity to be — as Dugin makes clear in a number of places — the Fourth Political Theory! God, however, cannot be treated as an afterthought. You cannot say, “God, too, is good, and has His part to play. First, we must deal with more pressing matters, but when the time comes, after these matters are finished with, certainly we will get back to Him.” God cannot be part of our program, our agenda, our worldview. God does not play a part because God is the All — He is al-Wasi‘, the Boundless, the All-Embracing, the Infinite. Only those who put God first in all things, who cannot love the earth, or their lovers, or their fellow human beings, or their narod (nation; ethnic group) unless these good things are loved in the Spirit of God, can be said to really believe in Him. Therefore, when Dugin declares that narod, not God, is his absolute, as he does in more than one place, he formally and explicitly renounces Allah (swt). In other words, the Bible does not call for Edom to awake, as Dugin suggests, but for Israel to awake and destroy Edom; here Dugin’s obsession with secretly inverting the meanings of spiritual principles — though obviously not as secretly as he had hoped — is clearly in evidence. Edom is also denounced by the prophets Ezekiel (25:12–14) and Joel (3:19–21). And who might the figure be that Dugin identifies with Edom and addresses as “Sire”? Edom is a kingdom, not a king. In Judaism, Edom is another name for Esau, the earthly, material man, brother and opponent of Jacob who was to become Israel, the spiritual man; this seems in line with Dugin’s rejection of Logos in favor of Chaos in his essay “The Metaphysics of Chaos” from The Fourth Political Theory. But who is the King, who is the Sire, of Edom? Who would Edom be if it were a king?